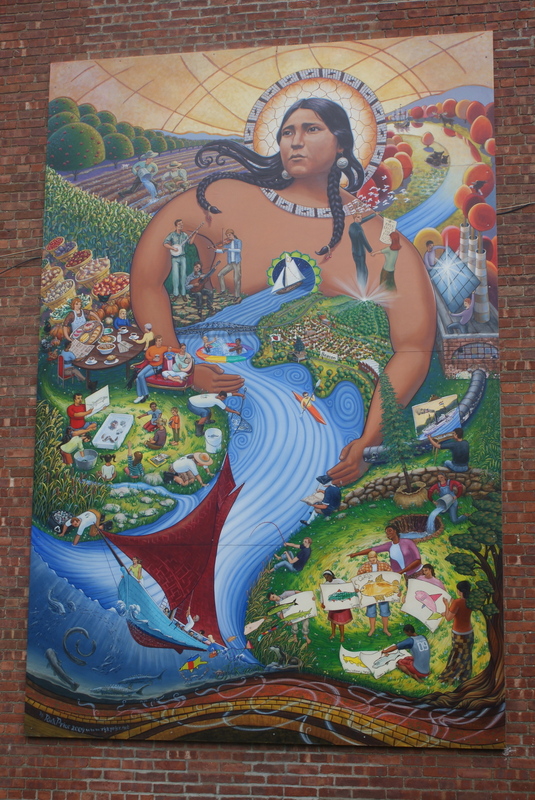 Whenever I get frustrated about how cold, or dirty, or loud, or impersonal the city is, it helps to take a moment to reflect on what drew me here- great art! The wonderful thing about New York City is the fact that art, visual and performing, both great, questionable, and small is all around. Today was a great art day. I didn't have to go to a concert hall, a theatre, or seek out a gallery, I simply went about my business and the art found me. My subway commute this morning was full of extraordinary music. There were jazz trumpets at Fulton Street, a Vivaldi violin concerto at 86th street, 96th street featured a stirring blues electric guitar performance and on the way back home, I was serenaded with bells and a lovely chorus of Hare Krishna devotees singing a round of mantras at Atlantic Avenue. Impromptu music isn't New York's only artistic virtue, the city is layered in colorful paint (and I don't just mean graffiti ). Artists make use of abandoned spaces. My favorite is this collection of portraits that bring the otherwise dull abandoned buildings in my neighborhood to life. Up and down Fulton street in Clinton Hill, Brooklyn, the artist Alan Aine's expressive portraits are part of the neighborhoods permanent collection. I love his work! There's a whole story behind the eyes of his subjects. And I, lucky me, get to view his creations for free. Although this writer and former actor is no longer an eager and helplessly enthusiastic new to New York, New Yorker, taking a moment to consciously bask in the city's art brings back some of that magic. Because, after all is said and done, despite the grit and grime, the noise, the rats and the smells, this is a magical place. This is the city that art built; a place buzzing with inspiration, creativity, and "I'm going to make it happen!" dreams. Behind the thick velvet curtain, the stage swirled with lively dance and song. I was confused, we were ten minutes early and people weren't in their seats, yet there were violins and drums and there was infectious merriment. "Pre-show," my friend Fred explained. The moment we stepped into the Bernard B. Jacobs Theatre we were drawn into the world of the play. It was as if we'd stepped into a pub in Dublin, only with auditorium seating. We couldn't resist purchasing some wine (I know beer would have been more fitting, but I just don't like it) before taking our seats. Served in a keepsake sippy cup the alcohol at "Once" was free flowing. We were able to sip from our seats and enjoy the pre-show entertainment, which blended seamlessly into the actual entertainment as the "Once" Broadway cast, brought the brilliant sounds of Dublin to the New York stage. At its heart, this is a love story, expressed in melodic song and rousing dance. It's the story of an Irish musician and his Czech muse. As the piece progresses, we're reminded how complicated, uplifting and bittersweet love can be. A combination of foot stomping ensemble pieces and acoustic solos and duets, "Once," is entrancing. You can't help but tap your feet. You'll want to get up and dance. I don't remember having this much fun at a show since I saw "Fela" a few years back. On Broadway at the Bernard B. Jacobs Theatre until January 4th, "Once" is a night well spent on the "Great White Way!" 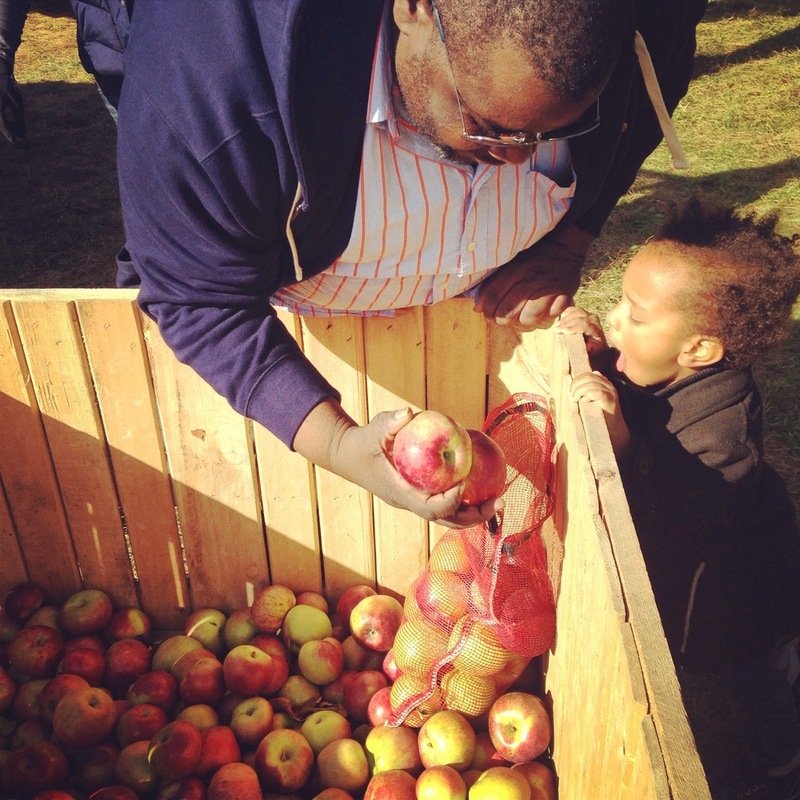 Picking Apples at Fishkill Farms: A Memorable Autumn Afternoon! Our tires crunched over leaves, stirring up small clouds as we navigated the narrow dirt road. It was a beautiful sight to take in, apple trees, row upon row, for miles. It looked like they extended into the horizon becoming one with the Catskill Mountains, a mass of apple trees, tapering into mountains, ascending into the clouds. When we selected our bags, the man said he thought only the golden delicious variety was left, it being so late in the season. To our surprise, the further we crept, we came across a group of plump rouged macouns. 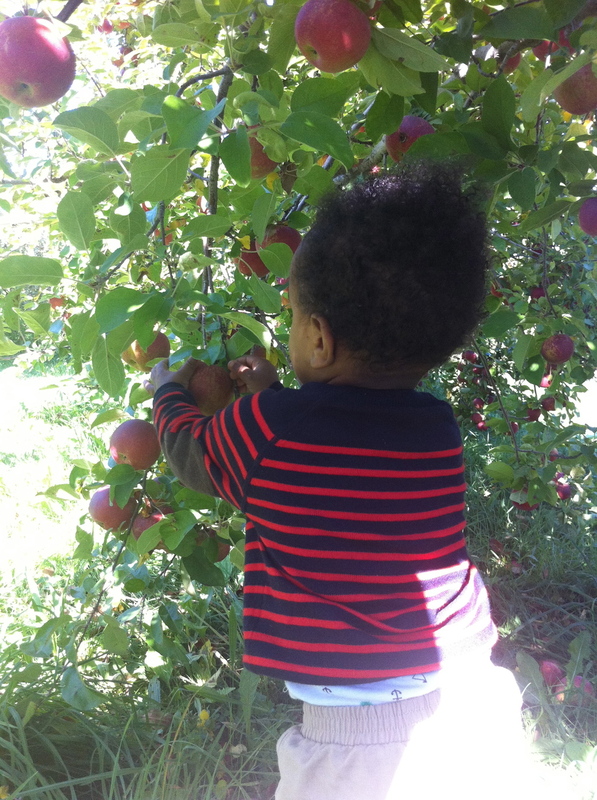 Grinning, from the thrill of discovery, mesh bags in hand, it was apple picking time! Apple picking, has to be one of my favorite autumn activities. I love the hunt for the plumpest, juiciest apples. The satisfying feeling of filling your bag with a group of imperfect, plump, leafy apples. I live for the smell of the earth and the streams of golden light from the sun filtering through the trees. 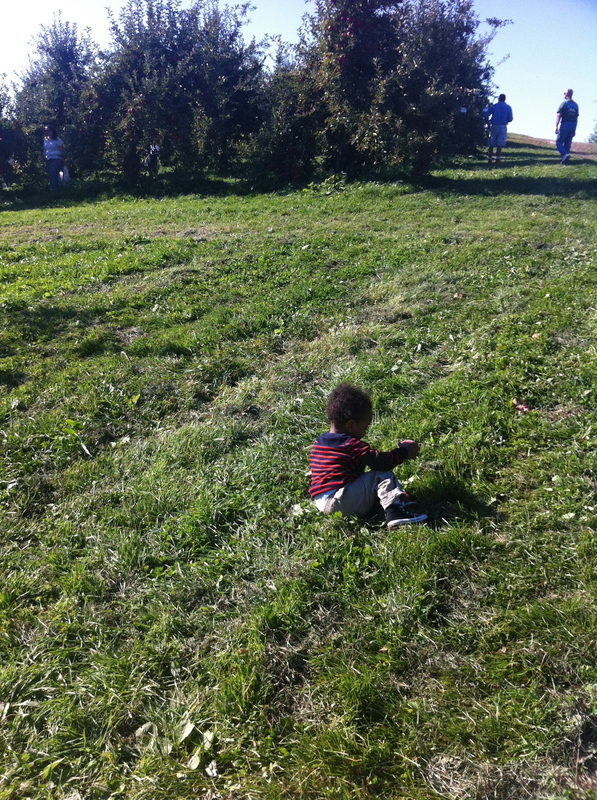 This year, I grabbed the boys and scooped up my friend Fred (you know you’ve found a true friend if they’re childless and nocturnal, yet still agree to spend the afternoon in an apple orchard with you, your toddler and your infant). Our orchard of choice was Fishkill Farms, about an hour north of the city. It was a great choice. They had a bit of everything. You could pick apples, pumpkins and even a selection of seasonal vegetables. 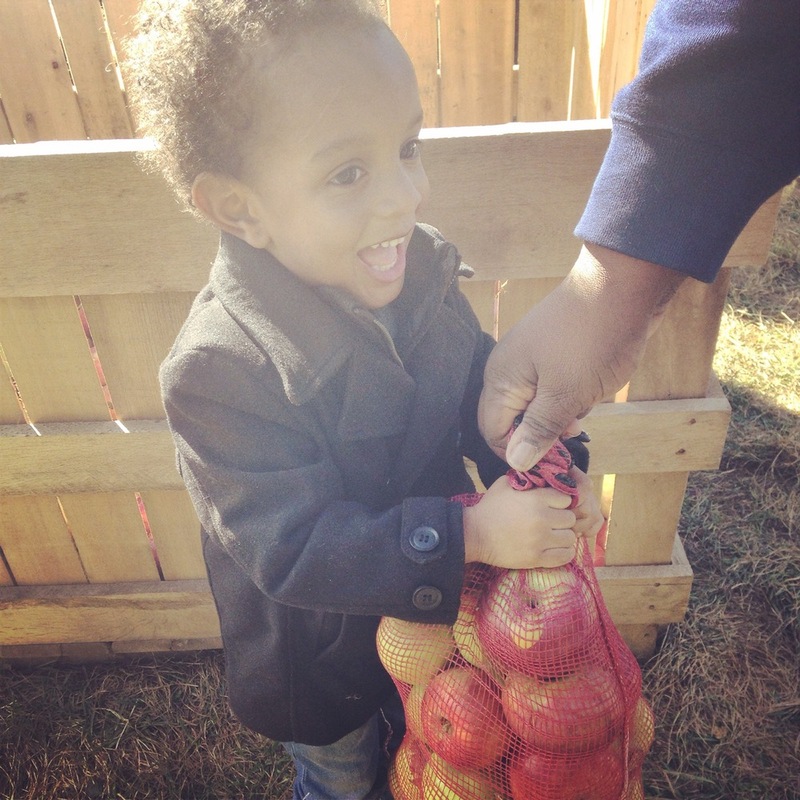 I stuck with the apples, since my little one was going to the pumpkin patch with his preschool. The country store smelled like apple cinnamon potpourri. Pies, tarts, jams, vinegars, ciders and pastries were on tantalizing display. I couldn’t resist taking home some of the freshly harvested vegetables and squash. Outside, despite the chill, the atmosphere was festive. Picnic tables lined the green spaces as live music serenaded us from a makeshift pavilion stage. On one side, there was a glorious stand selling hot apple cider and perhaps the best old fashioned donuts I’ve ever tasted. At the far corner, near the parking lot, a full-fledged barbeque was underway. Clouds of hickory scented smoke danced and vanished into thin air, as platters of chicken, ribs, burgers, corn and hot dogs emerged in savory gluttonous glory. Sampling a little bit of everything (why not? 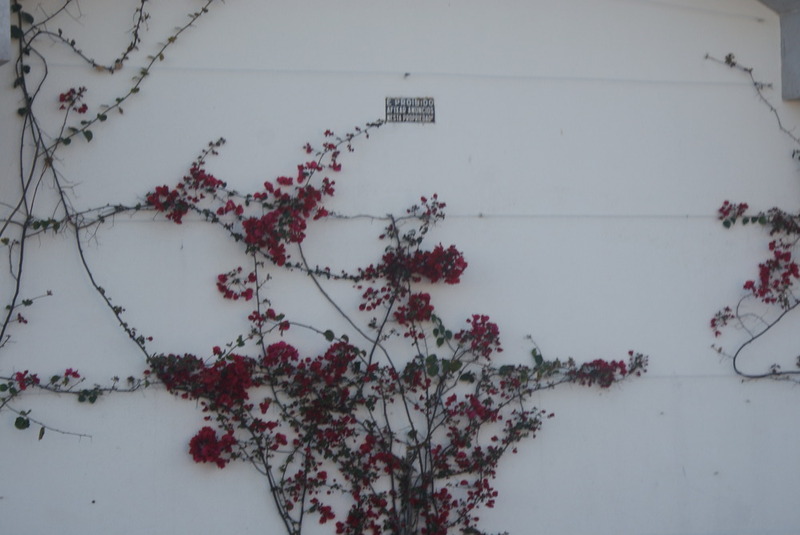 ), we took our time, eating, listening to music and basking in the ephemeral mid-autumn in between. Fishkill Farms we’ll be back! Thank you for the apples and awesome memories. This week my cousin Brielle, a postpartum doula, was in town from Seattle to help out with our new baby. It was her first time in New York, so I got to play tour guide. It was great to get back on my feet for a little bit while re-discovering the sights and sounds of Manhattan. Modern Art Lives in the Bronx! So, what is there to do in the Bronx? Good question. The Bronx is one of those New York City boroughs that exists as a mystery to many. Barring Yankee Stadium, The Botanical Gardens and the Bronx Zoo...what is there to do? Art, good restaurants, charming neighborhoods, stunning landmarks- the Bronx just doesn't have a reputation for these things. Most tourists don't venture this far north, many New Yorkers don't either. So what's there? I don't have an answer. The Bronx is an enigma. Despite commuting an hour and a half each way Monday through Friday to work, I know little about the area. I literally hop off the train, walk five blocks to work and then reverse. So I've decided to challenge myself to step outside of my Brooklyn/Manhattan comfort zone. For the next few weeks, I'm going to take the time to explore the Bronx. Located on the gritty Grand Concourse, the Bronx Museum of the Arts is a small contemporary art museum rooted in the Bronx community where it is located. Founded in 1971, the museum attracts both international and local visitors and has a steady rotation of exhibits on display alongside the museums extensive (over 1,000 items) permanent collection. Happy Halloween from Ft. Greene & Clinton Hill Brooklyn! Let the holiday season BEGIN!!!! Stretched before you, are acre upon acre of apple orchard. The afternoon sun, bursts through the leaves cascading downwards in powdery rays you want to run your fingers through. The trees, low to the ground are heavy with plump apples, not waxy like the ones in the super market, but a bit ashen, some draped in spider webs. "Apple!!!! Apple!!!!" Ohm implores on his tip toes, eyes hopeful, fingers spread wide atop outstretched arms. Mark wipes a small apple clean and hands it over. Ohm's fingers close in on the prize as he takes a crispy bite. He's all teeth, before setting off to explore the rows of apple trees. 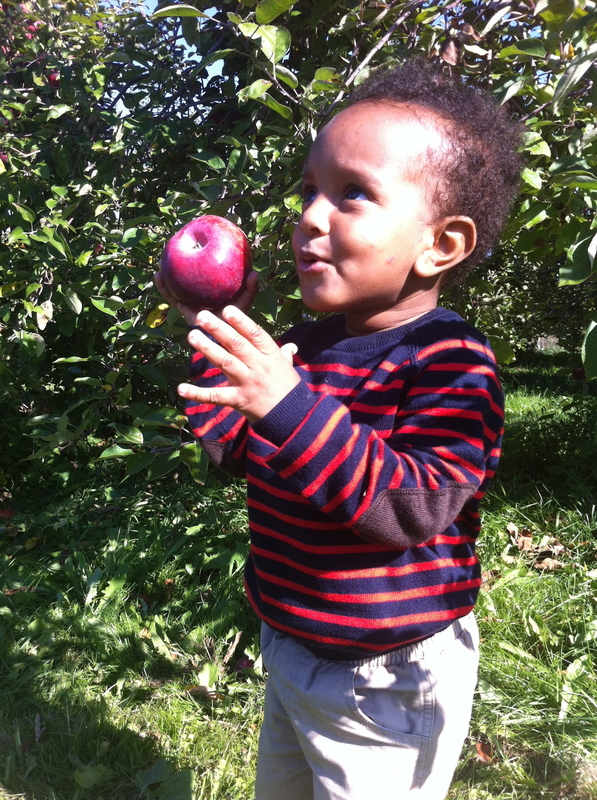 Apple picking is one of my favorite autumn activities and being from upstate New York, I must say, we've got the BEST! From Western New York to Long Island, there is no shortage of apple orchards to choose from. We went to Saratoga Apple in Saratoga Springs, about a three hour drive from New York City. 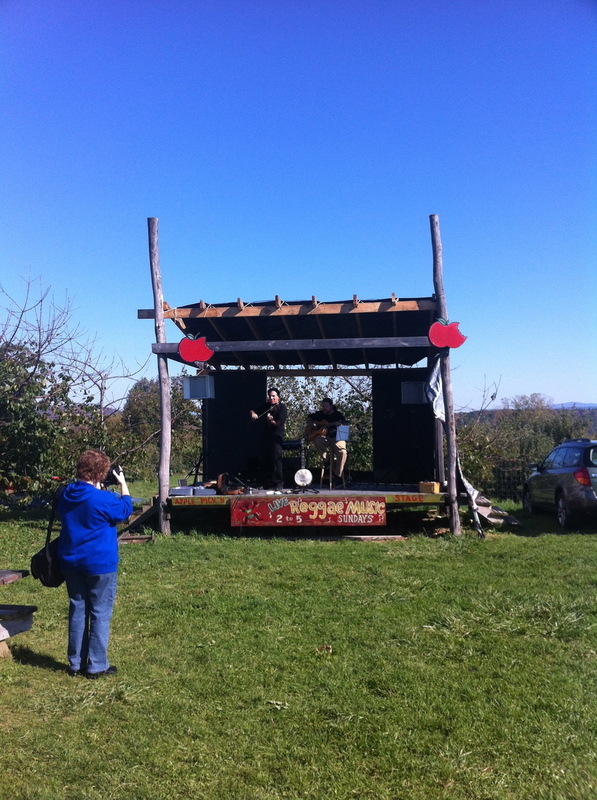 With acres of apple trees, a farmer's market, live music, hayrides, a baby kangaroo (yes, a kangaroo) and the best hot donuts and cider (possibly in the world), Saratoga Apple was well worth the trek. Here's how it works, you purchase a bag, there are three sides and you're free to collect as many varieties of apples as you can fit. If you're not sure what apple tickles your fancy, they have apple tastings. I was a big fan of the Crispin! After you've picked your apples, you might as well stay for lunch (there's a cafe), have some hot apple cider and fresh warm donuts (so incredibly amazing!!! ), enjoy the live music and browse the farmer's market. Have you gone apple picking this year? It has happened. I've started a full time job after my two year hiatus to raise Ohm, write and travel. To say that this adjustment has been easy, would be a lie. The days are long, my 90-minute each way commute from Brooklyn to the Bronx is insane, having two viable hours in which to spend time with my son and husband while trying to make time to write and travel has taken creativity, humor and patience. In the spirit of carrying on by all means necessary, I will focus for the next few months on weekend getaways. Autumn seems the perfect season to launch this exploration. It is the quintessential season of the quick crisp weekend away. Last weekend, Ohm and I, along with my friend Freddy, set out to explore breathtaking Beacon, New York. It was the perfect Saturday day trip from New York. Now that I'm back in Brooklyn, all I can think about is the shining sapphire view of the Hudson, the Victorian charm of Main St., and the artistic quirk of the boutiques and galleries. Deep in the Hudson River Valley, about an hours drive from Manhattan, lies a stunning and artistic little town called Beacon. The drive alone, along the Taconic, through Westchester County, past Bear Mountain and beyond Putnam, New York (probably not in this exact order) is a serene field of green and calm. Whether for the day as we did, or for an overnight stay at one of the beautiful colonial Bread and Breakfasts, Beacon, New York is a destination that is sure to invigorate your soul. 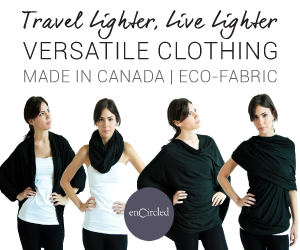 Stay tuned for more quick trip ideas! The aroma of Berbere is heavy in the air. It is a modest space, tables, chairs, a buffet table. On the wall, Ethipian prints have been hung and framed. Couples, friends, sit quietly as they enjoy the delicious food. This is my first Ethiopian Buffet. The food, is vegan, satvic, delicious. The food is local and organic. Hot injera is folded in a basket beneath a cloth napkin. It is a simple spread. Rice that looks to be seasoned with saffron, collard greens, lentils, cabbage and beets. Despite the simplicity, the buffet is aromatic, complex. I pull apart the spongy injera bread and scoop up a pinch of Gomen (collard greens). I scoop and scoop, each bite is refreshingly mild, balanced and mysteriously savory. Delicious. Sated, I lean back watching Ohm tinker away at the piano lining the far wall. Natural Oasis is a welcoming tot friendly establishment. One of the bonuses when it comes to vegetarian Ethiopian food, is that it is baby friendly. The food at Natural Oasis it is not spicy, making the perfect meal for beginning and emerging eaters. Natural Oasis is so much more than a restaurant, it’s a community wellness center. Just through the front doors, you’ll find a herb shop, where you can pick up Ayurvedic products, tinctures, teas, and other wellness products. Upstairs, you can receive Ayurvedic treatments, take a Kundalini Yoga class, get a massage, and be treated with herbal medicine. 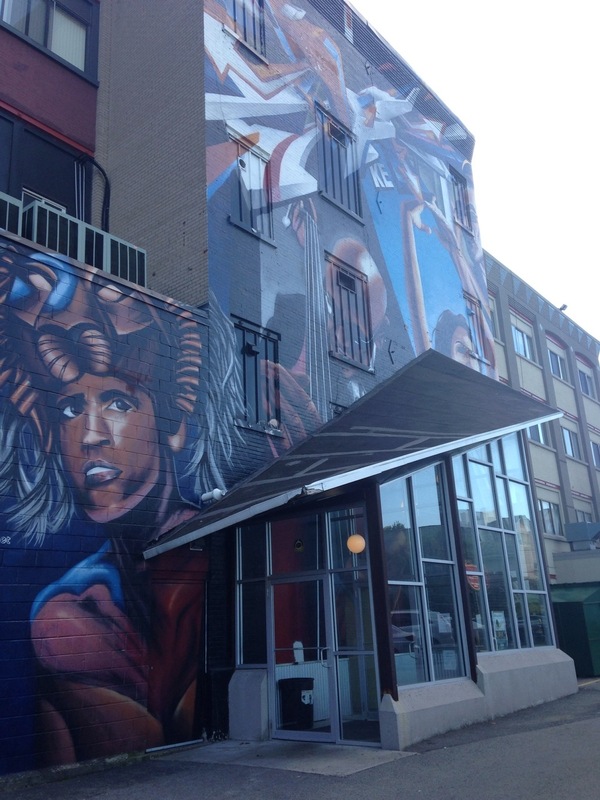 Rochester, New York is a suburban city, with its fair share of chain restaurants and food options, but if you know where to look, you’ll find a vast and diverse selection of local restaurants and alternative offerings. If you’ve never had Ethiopian food before and you’re curious, go to Natural Oasis. If you’re a vegetarian or a vegan in search of a new place to eat, go to Natural Oasis. If you love Ethiopian food, but always order the same items on the menu (guilty as charged), try the buffet at Natural Oasis and feel free to explore. If you live in or are passing through the Rochester area and are in search of a healthy plate of food from a locally owned establishment, go, go, go, to Natural Oasis. Natural Oasis’ Vegan Ethiopian Buffet is open Monday through Saturday from 1pm-4pm and 5pm-8pm. Are there hidden health food or Ethnic restaurants in your neighborhood that you’d like to shout out? Let us know about them in the comments section! The moment, we stepped through the glass doors, he was off. Flip-clop flip-clop, sticky fingers and a nose pressed against a 1,700 gallon aquarium. Flip-clop, flip-clop, climbing, problem solving, exploring, a toddler sized puzzle. Eyes wide, finger pointing, at a wide mouthed, wild eyed, golden pony aboard a Victorian carousel. Ohm moved non-stop for over three hours. He explored through his nap, and played through lunch. The National Museum of Play in Rochester, New York is an extreme kiddie wonderland. On a recent visit home, after dragging my poor 20 month old all over the Rochester/Buffalo region to visit relatives, old friends from high school and my best college buddies, I made sure to plan a special trip for Ohm. I guess I shouldn’t say plan. I didn’t actually have to do anything except show up, pay the admission fee and ta-da! The perfect afternoon found us. I’d heard people sing the praises of the National Museum of Play, I’d listened to the proclamations of greatness, but I honestly wasn’t expecting much more than a few brightly colored rooms of engaging fun to fill the space before nap-time. Rochester’s National Museum of Play is a world class museum, with more nooks and crannies and educational programs to experience than one has time to explore during one visit. Priding itself as being the only collections-based museum in the world dedicated entirely to play. The National Museum of Play is massive. After three hours and consequently missing nap-time, we only saw about a quarter of the offerings. Full of stimulating hands-on exhibits, Ohm was off and engaged from the onset. Wiggling out of my hand, he ran ahead of me, capitalizing on every opportunity to twist, turn, press buttons, and climb anything and everything. We ducked into toddler playrooms, where he socialized with the other kiddies and played dress-up. Attracted like a moth to the shiny golden ponies, we took a turn on the beautiful working carousel from 1918. It was all-aboard, as we chugged along the track through a simulated village on the kiddie passenger train. There were science displays, collections of old fashioned teddy bears and dolls. There were tea-party sets and pianos to play. The National Museum of Play is truly an experience. Home to the world’s largest and most comprehensive collection of dolls, toys and games, one can enjoy a life-sized doll house then walk down memory lane at a 1980’s style arcade full of vintage video games. This is a place to build memories. We didn’t make it to the indoor butterfly garden, or to the life sized Bernstein Bears exhibit, or to the American Comic Book Heroes display. There just wasn’t enough time. We did make it to the life sized Sesame Street exhibit, featuring the characters, scenes and experiences from the show. Ohm got to meet his best friend Elmo, drove Cookie Monster around in a taxi and screamed in mortal fear at a ten foot tall big bird (those eyes were creepy). We played supermarket in the life-sized simulated Wegmans Supermarket, where kids push mini carts down tiny isles, where they can grab their favorite food. The piece de resistance, is when they get to send their purchases down a conveyer belt where they can scan and bag their items. Ohm was focused. When he realized it was time to leave, he almost had a meltdown. I had to distract and trick him to get him to leave mini-supermarket land. Luckily there are plenty of distractions. Story Time is announced over an intercom and occurs several times a day. A 1950’s style dinner near the lobby serves up tasty soda shop style snacks and meals. Ohm and I had a ridiculously good time at the National Museum of Play. If you live near the Rochester, New York area or are traveling through with a child, this is a stop you MUST make. Have you visited the National Museum of Play? What did you think? Madiba Restaurant in Ft. Greene, Brooklyn brings the tastes and sounds of South Africa to New York! Peri-peri prawns, roti, and shima. Whenever I miss the flavors and sounds from the “good ole’ days” in Mozambique, South Africa and Swaziland, I take myself to Ft. Greene, Brooklyn’s Madiba Restaurant. Named after Nelson Mandela, Madiba is a portal from Brooklyn to South Africa. Specializing in South African cuisine with all of its unique influences from traditional Zulu dishes like Uputhu/Pap (boiled ground cornmeal with tomato-onion gravy) to Voortrekker inspired dishes like Boerwors Roll (herbed beef sausage with gravy on a hot dog bun) and Indian inspired dishes featuring an assorted variety of succulent curries and chutney, Madiba takes me on a journey of the senses each time I step inside. Some of the dishes draw inspiration from the tastes of Mozambique (South Africa’s next door neighbor). I can honestly say that I have never had a bad meal here. Never! The food is always fresh, all-natural and served up gourmet style. Vegetarians and vegans rejoice, there are plenty of options for you. If you come for brunch, the coffee is excellent- nice and rich. If you come for dinner, Madiba boasts an extensive South African wine list, and they even import my favorite liquor- Amarula! I love the attentive yet slow service. You are not rushed in Madiba, one can enjoy a slow brunch or a slow dinner. You’re encouraged to taste your food, draw energy from the atmosphere and enjoy the people in your company. At Madiba there is an immaculate attention to detail. The décor is distinctly reminiscent of South Africa, much of the music played is African. One can even purchase South African goodies from the shop at the front of the store. The selection of quirky imports brings me back to my days in Mozambique (much of the food in Mozambique was imported from South Africa) from the Jungle Oats Oatmeal, that I ate for breakfast to the Ramany Cream biscuits I splurged on every pay-day, to the Ceres boxed juice that kept me going beneath the hot sun; Madiba brings the tastes, sounds and charms of Southern Africa to Ft. Greene, Brooklyn. For a refreshing spin on breakfast, try Madiba’s Sunday Brunch, which starts at ten am. Okay Sojourner, so what are you getting out of this promotion? Nothing! Just the satisfaction of sharing one of my favorite Brooklyn restaurants with you, my readers. I hope you get to experience Madiba. I know you'll enjoy it as much as I do. Do you have a favorite restaurant that reminds you of a place you've traveled? It is early and you're disoriented. Your boots clack as you make your way towards the end of the cement subway platform. There is a windy chill sneaking underground from a grate above you. As you take your place, coffee in hand, something catches your eye. A potato chip bag, a red UTZ bag to be specific, is moving in curious circles. It is most definitely not being propelled by the wind. Cautiously you step closer and realize the bag has a tail. You promptly back away, but you don't back too far away, because you still need to be at the end of the platform, you still have to make it from Brooklyn to the Bronx to lead a workshop that starts promptly at 8am. You can't take your eyes off the bag. You watch it wiggle and sway, until out pops the culprit, a brown mid-sized rat. Not too large you note as far as New York City subway rats come, but not a small fellow either. Luckily, you're not afraid of rats, you regard him as entertainment. You are drawn in by his shiny little eyes and swear you can almost make out a set of delicate eyelashes. He's rather cute you think to yourself as he grips a potato chip in his front claws or paws or whatever rat hands are called. You can't help but think that if you were the little fellows rat mother that you'd probably name him Thistle, or Sage, or Buckley, or, no-you decide, Thistle, definitely Thistle. You smile at Thistle as the train roars into the station. Thistle does not smile back, he looks terrified. The noisy clamor startles Thistle and as the doors open, he leaps into the train car ahead of you. As you make your way towards your seat you look for Thistle. Others are looking too. Most people attempt composure, pretend they are too cool to be ruffled by a rat, while others scream and jump on their seats in panic as young Thistle, at least you think he's young, scurries the length of the train car beneath the row of seats. You smile. You root for your friend as a group of construction workers try to smash him. Up and down the length of the car Thistle runs. Unaffected hipsters lift their boots to allow Thistle free rein. Men and women in suits hop from foot to leather clad foot as Thistle rushes past. A homeless man wrapped in a stained quilt tilts his furry head back and laughs a hearty toothless laugh. "Yo, did you see that!" a group of teens bogged down by sagging backpacks runs to the opposite side of the car. As the train screeches into Union Square, off Thistle bounds the moment the doors part, his wiry tail waving goodbye. You grin as you sip your coffee and laugh with the strangers who share your morning commute. You could be anywhere this morning, but you're in New York, arguably the worlds most unpredictable city and you just rode the train with an unpredictable rat named Thistle. *This is a true story. Names have been changed to protect the innocent. In an unassuming brick building in downtown Brooklyn, you'll find a cultural gem- The Museum of Contemporary African Diasporan Arts or simply the MoCADA. The MoCADA is a vibrant and intimate museum space featuring paintings, photographs, sculpture, music, performance pieces, and installations that relate to the experience of the African diaspora as experienced in a contemporary context. It is an incredibly unique space with a community feel. The one-story museum is small and is comprised of three main rooms in which to experience the exhibits. Through the entrance you'll find the gift shop which is an experience in and of itself. The gift shop features an inspiring collection of books, art, jewelry, toys, crafts, and various other trinkets from local artists and artisans. 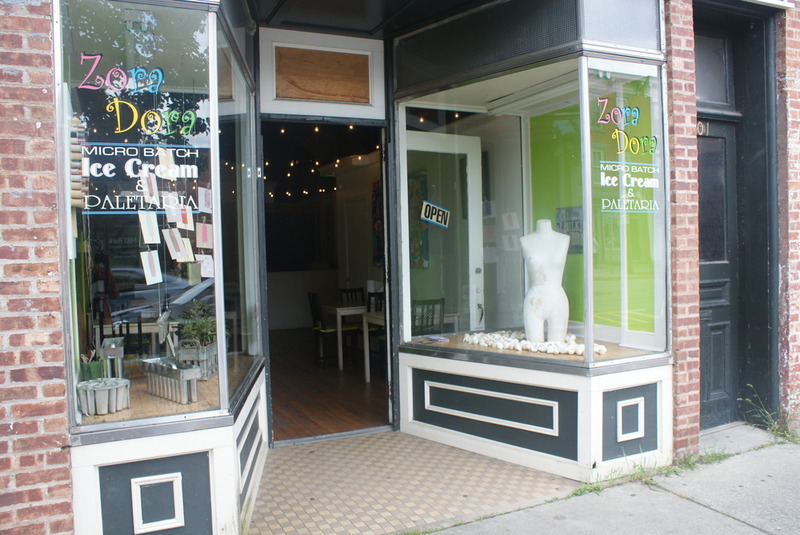 It is a great place to shop for unique gifts and you'll be supporting local talent. We clicked our delicate flute glasses together with a 'ting'. Veuve Clicquot tickled my tongue before sliding smoothly down my throat. Outside, wispy snow flakes tumbled from the sky, framing the base of Central Park with a soft haze. 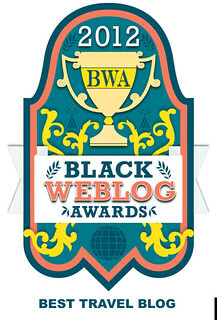 Krista's clutch, black velvet and petite, glistened on the arm of her chair. Our waiters shoes, shined to perfection, slid gracefully over the carpeted floor. In the distance music played softly. In the window, I smiled at our reflection. It was the perfect day to dust off my pearls. It was a lovely afternoon. New York had been a bully lately. Within the span of a week, the temperature dropped 40 degrees. Chilly blue skies were replaced by gray clouds and biting cold. Howling winds, slippery streets and a massive flu outbreak have made hibernating in my apartment, having food and wine delivered, and streaming Netflix a very attractive option. After a week of being a relative hermit however, cabin fever set in. I was itching for something fun to do. Not enough snow to play in, too cold and wet to enjoy the outdoors, things looked bleak. My friend Krista shared my weary winter blues and it was decided that instead of spending Saturday at home in our sweatpants with Netflix, we would go all out, get dressed up and enjoy a lovely (albeit cold) afternoon sipping champagne at the Plaza. It was the adult equivalent of a little girls tea party. The Champagne Bar at the Plaza Hotel is a wonderful place to retreat to for a quick escape. Through the lobby and to the left, the champagne bar in all of its splendor, awaits you. The ambiance is everything you would expect from the Plaza hotel. Elaborate crystal chandeliers hang gracefully above the immaculate marble floor. We lounged the afternoon away in plush velvet chairs, clinking glasses as we enjoyed our unobstructed view of Central Park and the line of Clydesdale carriage horses ready to chauffeur tourists to and from.I was the perfect escape! The next time you're in Manhattan and find yourself on fifth avenue, why not treat yourself to a well deserved mini break from the hustle and bustle of the city. Game Time at Brooklyn's Barclays Center- Go Net's Go! I am many things, a sports enthusiast I am not. A resident of Clinton Hill, Brooklyn, I, like many of my neighbors watched with curiosity and some anxiety as our neighborhood underwent a massive change - the arrival of the Barclays Center Stadium. I watched the Barclays stadium grow, almost rod by rod. I watched my husband and his friends salivate and buzz with glee at the prospect of Brooklyn gaining its own NBA team. I watched, I waited, until one day in the early Fall it had transpired. Brooklyn was the home of a world-class, state of the art, arena. Off we walked, one chilly evening, Mark, Ohm, and I (well, technically Ohm was carried), 15 minutes down Atlantic Avenue towards the Barclays Center to catch one of the first games of the season. Whereas I wasn't particularly thrilled about the prospect of sitting through a basketball game, I was curious about the massive new stadium that had descended upon Brooklyn like a spaceship. The stadium had garnered quite a buzz and not just from sports fans. There was a prominent roster of concerts that the venue was slated to host. After making our way through the very long line that snaked around Flatbush, we were greeted by an ultra-modern, classy and clean event space that more closely resembled a fancy office building than a basketball arena. I was impressed. As we made our way toward the concessions, I was astonished. Instead of the standard popcorn, hotdogs and soda, there were local gourmet food options including, sushi, Junior's famous deserts, Blue Marble Ice Cream, a fresh salad, a Habana Outpost stand and a host of other delectable local Brooklyn favorites. It was, minus the basketball part, my kind of stadium. Our seats were comfortable as far as seats go. The game happened as far as games go. People cheered, players played and I read magazines and snapped pictures. At 16 months, it was Ohm's first basketball game. He had a great time, as did the other children in the crowd. I was surprised to see so many little ones. As far as venues go, it was quite child-friendly (just be careful on the very steep stairs). Rochester, New York has been nicknamed the “Lilac Capital of the World”, one visit to the annual Lilac Festival and you’ll understand why. Rochester is lovely in the spring. Perhaps nowhere, at this time is she lovelier than in Highland Park, where as April transitions to May, the park morphs from rolling green hills to the grand stage for the famous fragrant lilac bush displays. Established by mere coincidence in 1898, when 3,000 people turned up at Highland Park to view the picturesque assortment of lavender, rose and cream colored lilacs; Rochester’s Lilac Festival is a source of city pride and tradition. What began in 1892, as a showcase of 20 varieties of lilac bushes arranged by horticulturist John Dunbar, has grown into an internationally renowned spectacle paying reverence to no less than 500 lilac varieties. Lilac loving visitors flock to Rochester crossing cities, states and continents, to experience the beauty of Highland Park’s famous lilacs first-hand. In addition to lilacs, you’ll find music, entertainment, child-friendly activities, horse carriage rides through the park, food, lilac wine tasting events, lilac soaps, perfumes and other lilac inspired products. If you want to be swept up in the romance of the spring season, Rochester’s Lilac Festival is the destination for you.